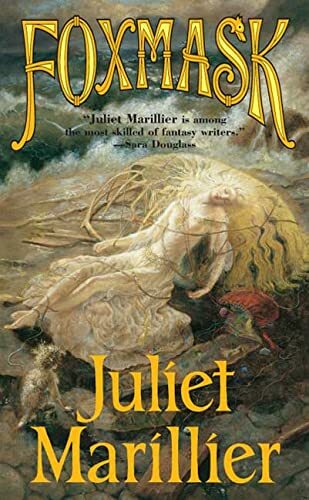 I first read Wolfskin by Juliet Marillier in 2009–and even though it was excellent, it took me five years to finally get to the sequel. Partially that’s because, in the intervening time, I also read Marillier’s six-book Sevenwaters series, and her Bridei Chronicles trilogy. It wasn’t until I reread Wolfskin that I also realized another possible reason. Marillier writes amazing, powerful, emotionally-intense books…and they’re kind of exhausting! I highly recommend everything she writes, but I also highly recommend blocking off substantial time for reading–and you probably want to bring tissues. Since I often review YA, I think I better note that, despite having young characters, these books are definitely for older readers, due to both specific content and “adult themes,” as they say. Wolfskin begins in Norway around 1000 AD, or maybe earlier (I can’t find the time nailed down anywhere!) Eyvind dreams of growing up to be a Wolfskin, powerful Viking warriors who care for nothing but the call of Thor leading them into battle. Eyvind befriends Somerled, a solemn, scholarly boy who dreams of becoming king, and they make a vow of loyalty as blood brothers. As adults, Eyvind becomes the warrior he wished to be–and his vow draws him with Somerled on an expedition to the Light Isles. Here Eyvind (and the reader) meet Nessa, princess of the Folk and priestess of ancient mysteries. Her people are threatened by these new arrivals, and Eyvind finds himself torn between loyalty and conscience. 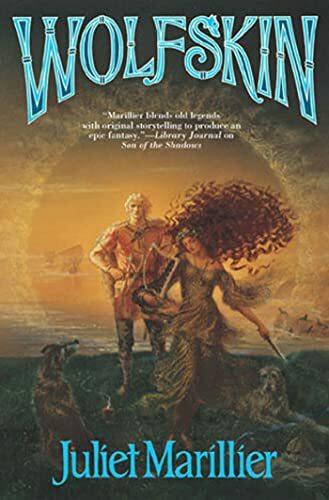 Marillier brings us into a fascinating and very grim world of the Vikings, where honor and loyalty are powerful forces, and vowing allegiance to the death is not in the slightest bit metaphorical. When we first meet him, Eyvind is (to borrow from Terry Pratchett, of all people) simple but not stupid. He’s intelligent, but his views are black and white, his goals are straight-forward, and he asks few questions. The Wolfskins are known for their unthinking courage. On the Light Isles, Eyvind begins to think, to try to make sense of a situation that grows increasingly troubling, and this shift is in some ways devastating to him. He grows a lot as a character, but it’s a painful growth. Eyvind is in sharp contrast to Somerled, who would never think in a straight line if there’s a twisting option. He’s cunning, clever, manipulative and deeply ambitious. And it’s not that Eyvind doesn’t see all of that–but he struggles for much of the book with trying to determine the real Somerled (because for all his flaws, he has a spark of greatness too) and with where obligation lies if you’ve sworn loyalty to the wrong person. Nessa and her people are close to nature, value ancient rituals and respect spirits and magical beings who share their island home. (There’s not a lot of fantasy elements here, but they’re definitely present, and prominent in the conclusion.) Nessa has her own struggle, about how to serve her people in a time of crisis, as both priestess and princess. Wolfskin is not a heavy book in terms of writing style, but it’s emotionally heavy. Devastating events unfold, light spots are few, and characters’ journeys are hard and complex. Mind you, it’s an amazing book! But heavy. Foxmask picks up some twenty years after Wolfskin. At eighteen, Thorvald first learns the truth about his father, and sets off on a journey across the water in search of answers. His loyal friend Criedhe stows away aboard his ship, convinced that he’ll need her on his quest. They arrive, exhausted and storm-blown, at a rocky group of islands. Here they’re drawn into a strange conflict between the human settlers and the mysterious tribe of the Unspoken, who possess cruel magic they will use against the humans until someone returns their stolen seer, a child known as Foxmask. But the mysteries and tragedies grow only darker as more is revealed. So if the first book was grim, the second book is grimmer! Still excellent, still amazing, but so grim. I struggled a bit in the first couple hundred pages, with two different problems. First, I didn’t like Thorvald very much, and I couldn’t tell how much Marillier wanted me to like him (not as much as I worried about). Second, she raises up a pretty terrifying potential fate for Creidhe, and this is an author who sometimes lets the worst happen (but it didn’t here). So, once I got far enough to feel more secure on both these fronts, I could relax a little more. I’m telling you ahead, so you can relax at the beginning. Well, sort of. It’s still emotionally intense, of course! Thorvald is moody, self-centered and takes Creidhe far, far too much for granted. I’m not sure that he has much in the way of redeeming qualities at the beginning of the book, but over the course of his quest he grew on me some. He grapples with his own flaws, and finds some virtues leading others. I never wound up loving him, but I don’t think I was supposed to (and I didn’t need to, to be satisfied with the ending). Creidhe probably undergoes a less complex journey, although she does gain some humility, and a clearer vision of what she wants in life. And it’s really quite hard to talk about the rest of the book without a lot of spoilers! But I will compliment Marillier on her ability to take a dark, troubling situation, weave love through the heart of it, and bring out something beautiful. I’ll also just note that I’m not sure she has ever made me wait quite so long for the happy ending. I mean, the last three pages probably! Marillier is the master of page-turning endings (sometimes for 200 pages at a stretch–Well of Shades was painful!) but this one really waited until the very end. You have been warned. These are not casual reads, but they are both wonderful. If you want something lighter, read Marillier’s Wildwood Dancing, but if you’re up for a more complex, challenging read through ancient cultures and twisting plots, these are excellent too. These are books I would love to own simply because of the Kinuko Y. Craft covers. She is such an amazing artist.